One of the most experienced and skilled people in the craft of bathtub refinishing has set up shop in Fresno! Wayne Watkins, with over 28 years of full-time experience in beautifying bathtubs, has opened a second office of The Bathtub Medic in Fresno. Wayne started The Bathtub Medic in Santa Rosa in 1998, after having refinished tubs for eight years in Connecticut. So after nearly three decades of experience, having worked on many thousands of bathtubs and showers, Fresno-area residents can benefit from one of the most experienced people in the industry. 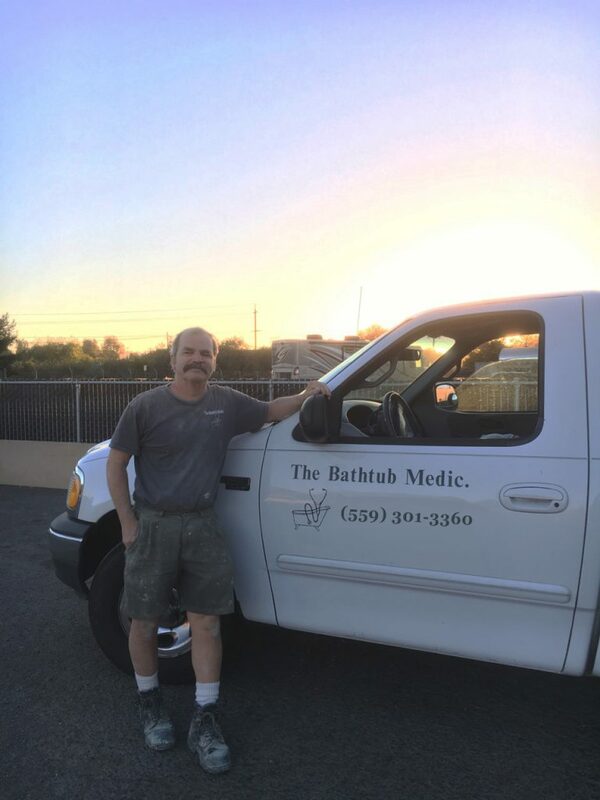 The Bathtub Medic has an impressive resume, having earned the Better Business Bureau’s highest A+ rating each and every year for 20 years in Santa Rosa. Companies such as Jacuzzi, Home Depot, Lowe’s, Pace Supply, Maax Bathtubs, and Milgard Windows chose us to do their repairs and installations. We also earned a 5 star rating with Yelp. The reason for this success is simple: The Bathtub Medic takes the time to do the work correctly the first time. It takes us a full day and a half to refinish a porcelain tub, for example, and three days for a full-sized fiberglass bathtub. We take the time to sand and polish every square inch of the newly-refinished surface of the bathtub, which leaves the entire surface smoother and shinier and importantly, much easier to clean than a rough surface. We also take the time to mask off every inch of the floor of the bathroom, as well as the walls around the tub, to fully protect the work area from overspray. Contact us today for a free estimate. You’ll be quite pleased with the results. Wayne resurfaced my bathtub, which was old and stained but not chipped. His crew arrived on time and went directly to work cleaning the tub and patching small pock marks. The second and final day, they finished the painting, drying, and polishing. I opted to let it cure for over four days. It looks like glossy new. They restored a great old porcelain over cast iron, five foot tub. It’s great.